There's a ton of action in the neighborhood these days. 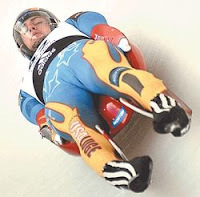 The Luge track at Mount Van Hoevenberg is hosting the World Luge Championships this weekend. The cross-country stadium will host some 400 competitors for the Lake Placid Loppet on Saturday, right next door to the sliding venue. Art Jubin's famous Full Moon Party at Cascade Ski Touring Center, the other direction down the road, gets underway around 8:00 Saturday night. One of the best dance bands around, Johnny and the Triumphs, will be playing and skiers will be dancing. Non-skiers too. On top of this, the Village of Lake Placid is trying to show the world we know how to throw a party according to one of Lake Placid's partying experts. As if that was ever a question! As aside, you might want to click on yesterday's featured photo so it is enlarged. I challenge you to not smile!